At The Ironing Shop we believe Dry Cleaning an item to make them look their best, which takes time and skill. Each item is professionally cleaned in accordance to the manufactures care label. Stain removal takes experience and knowledge to make sure it is safely treated without any determent to the fabrics. We prefer to do comprehensive and thorough process which can take time, most items are ready within 2-3 days. An express service is available for times when you need them quickly. Please note that we cannot always remove a stain, especially if you do not allow us the time to work on it. We will of course do our best but sometimes there is no quick fix. We are on the high street in Tuckton, near Southbourne. 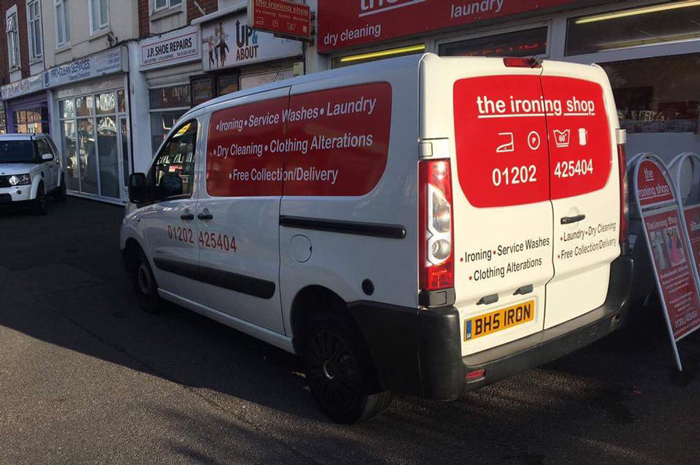 Our ^FREE collection and delivery service and we collect your Dry Cleaning from Bournemouth, Christchurch, Poole, Ferndown and surrounding areas. Dry Cleaning is a small industry and we have carried out extensive research on the local competition. The owner of this business personally knows most of the other local dry cleaners. We know that not all dry cleaners are as vigorous in their processes as we are. Some larger Dry Cleaner chains are told not to treat a stain directly due to lack of training and knowledge, in fear of damaging the item. They simply put the garment in to the dry cleaning machine and hope for the best, occasionally repeating the process. Others charge extra for removing a stain. Admittedly not all items need specific attention but the Dry Cleaner will professionally assess each garment throughout the process to give you the best possible results. So if you want your clothes to be given a thorough clean and expertly pressed to make them as good as possible let us look after them for you! The better your clothes look the better you look.